My name is Toni Hennigan and I am part owner with my husband Brian Hennigan for the JDog Junk Removal & Hauling- NE Tarrant County franchise. Brian and I married just over 2 1/2 years ago and have a blended family with my daughter Samantha (14), my sons Casey (27) and Hayden (22) and Brian’s son Brandon (29). I worked over 22 years in Mortgage Operations until we married when I was able to stop working and stay at home. I will be managing all Administrative and Customer Service Operations for JDog -NE Tarrant County. Brian has Worked 30 years in Mortgage Sales and will continue with that career path while jumping in to help with our JDog business evenings and weekends. We live in Colleyville, Texas. Our son Casey is Territory Director for our JDog operation handling marketing and truck operations. Casey served in our military as a combat infantry man in the Army and fought in Iraq and Afghanistan. Casey was with the 2nd Infantry Division 1-23rd Battalion 3rd Brigade. After he left the Army, he spent a year and a half working in the oil fields in North Dakota and South Texas. He later moved back to North Texas to work in sales for a brief period of time and project management as well. He is now up and running full time in the JDog truck in YOUR community. Our other son Brandon is the Operations Manager for JDog. Brandon graduated from University of Texas at Arlington. He has most recently been managing his own lawn care company, Aloha Lawn Care and working at Home Depot. Brian was an Military brat as his father was a retired Colonel in the Air Force and served over 100 missions as a fighter pilot over the Vietnam conflict. Because of these family ties to the military we have always tried to help our Veterans when possible. 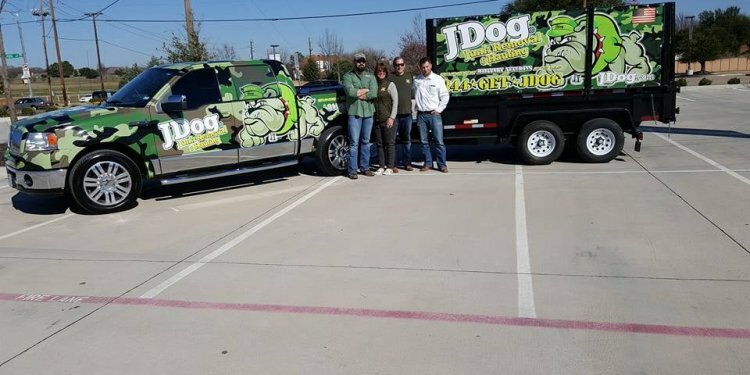 While looking for a small business or franchise to possibly purchase we came across JDog. When researching the story behind this company I felt an immediate connection. When my son left the Army and started looking for work as a civilian there was not a lot of open positions for “combat infantry man”. He struggled to find people willing to hire without a degree or experience in a specific field. When we asked Casey if he could do anything as a job/career what would he do he said “anything that could help our Veterans, there just isn’t enough there when/where it is needed”. JDog is that type of company! By purchasing this franchise we have achieved our new business goals but also we plan on bringing our two oldest sons on full-time to run the trucks and marketing in our territory, therefore putting our Veteran to work. As our company grows we will look to continue to hire other military personnel/Veterans and also serve our military/Veteran community by helping with their junk removal and hauling needs.